One light extends and compresses to create all universal appearances. Each extension can lead to a new locked potential, a new threshold. When that threshold is reached, a substance is changed into another substance. The Light-Wave Evolution principle displays the order of locked potential, which comprise the steps of substances created by Light. To speak about energy, we must acknowledge that energy is either in an unbound state, like sound moving through the atmosphere. 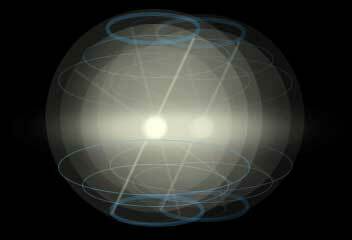 Energy also moves into bound systems, like atoms, molecules, and objects. 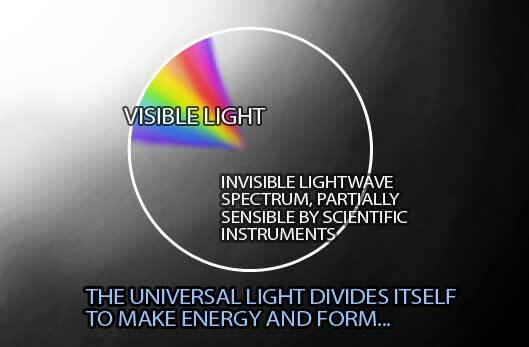 All energy in both conditions comes from the same energetic source, which can be found on the spectrum of "light" that includes not only visible light, but all other variations of the wavelength. This is a Light-wave universe, and all methodology is tied to the same creating system. Energy is either in a bound system, such as an atom or a star, or it is being directionally radiated, the way light shines, or sound travels. Bound systems build until the environmental condition that caused this building has ceased, after that, the bound system begins unwinding. Radiation is the unbuilding: the light that shines from stars is the released bound energy of that star system. WITH VARYING STATES OF THIS CONDITION. UNBOUND ENERGY such as starlight is seeking equilibrium with the entire universe, returning back to its original condition. This energetic winding and unwinding has stages of evolution that represent all states of energy and matter. Each stage toward winding or unwinding has universal checkpoints that determine how long a state or condition will last. Undulations between the current state of an energy and the state that energy must next become, because it has either expended its current thrust of energy and thus must contract, or because the contraction has led to the need to expel internal pressures and thus expand. Each such alteration leads to the potential to build, or to disseminate and un-build. The current state of any object or energy determines if the current state is primarily building or un-building. If the overall environment that houses the condition is building, then the condition is building because it is being fueled energetically by the condition that created it. When the environmental condition that creates an energy ceases building, then the condition will begin to unwind its energy as well. 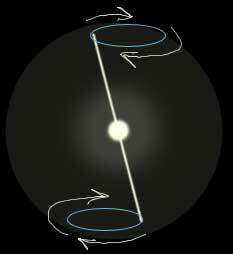 This is how a star compresses/builds energy into atoms, and conversely how a star ejects light rays that decay eventually into space. A) When an energetic condition arises, so that and area has bloomed with that condition - that energy can begin to manifest points of changed schemata: a new arrangement of energy will coalesce around points of 'interest' where a new type of energy can bloom by itself. That new substance remains in connection to the originating system, and continues to be affected by all other systems that it touches, lay within, and supersedes beyond. - Compressing energy eventually caves in. 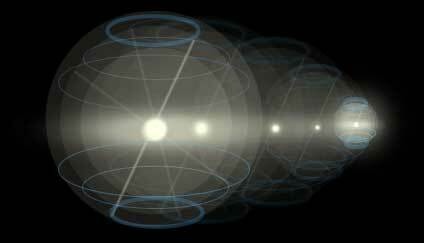 - Energy collection centers eventually amass and become an "object" that can float in the sea of space being manifest around it. B) Energetic ‘crowding’ continues the compression until some of that environmental energy can leap into another threshold, which un-crowds the environment. 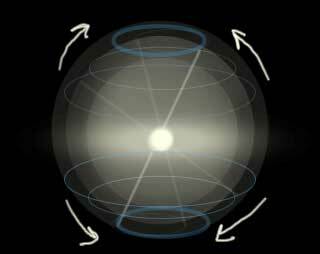 A new threshold is reached, and temporarily locked, and the original environment is now a separate energy type from the new central core of this born energy system. C) If the environment continues applying pressures, the system will build again towards the next energy threshold. When that threshold is reached a new substance will emerge, and it will remain so long as that new substance’s system lasts before it unwinds to a previous threshold. 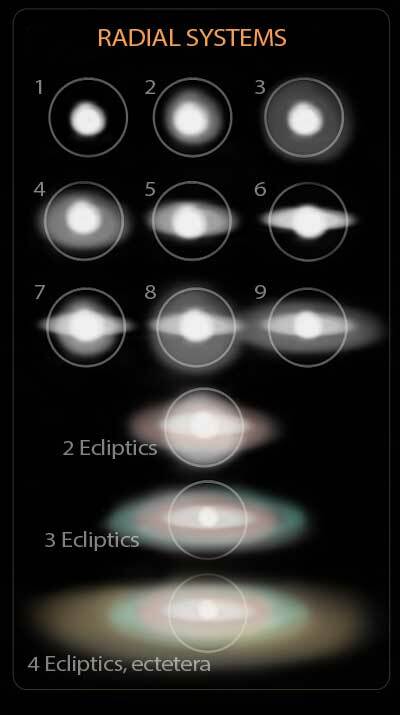 The image below shows all stages of galactic evolution. When the threshold of radiance begins, spirilization can begin, just like the previous picture shows. Each diagram shows different ideas of co-existing electric and magnetic conditions. The following chart displays 4 states of energy in similar arrangements for 3 different energy types. These radial systems expel energy according to limits that the internalized system allows. 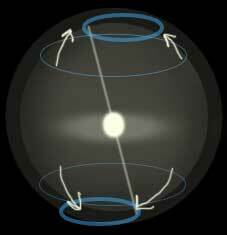 - In the instance of the hydrogen atom, the radial system continuously repeals it's expansion. - In the instance of the exploding stars, the threshold of controlled radiance has be surpassed, the interior core has lapsed in sturdiness, having lost backed-up energy stores, and the radial combustion process has exceeded all limits of systemic coherency. - In the instance of the nuclear explosion, an intentional system has been arranged to destabilize atoms to force a continuous ejection of stored energy until all that energy is expended. 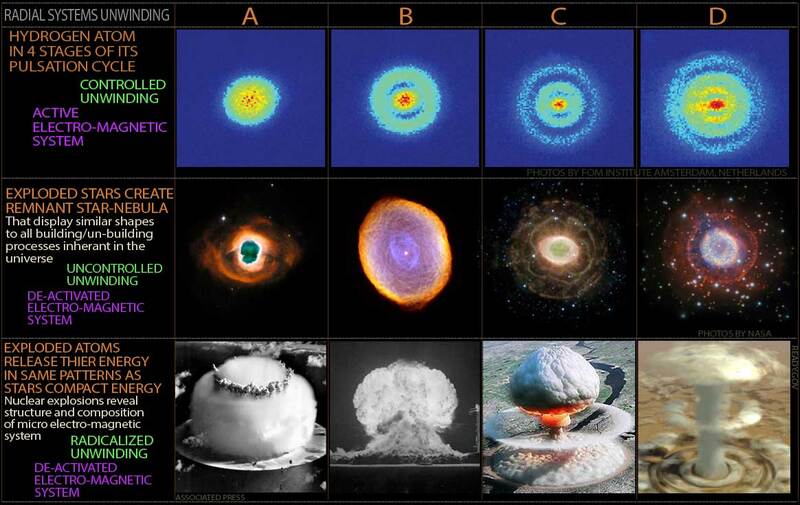 Spherical potential zones invisible to the eye are being released by this nuclear explosion. These zones are revealed in the cloud patterns. The funnel or mushroom clouds display the reverse of the same pattern by which stars compact pressure. This explosion is the opposite. 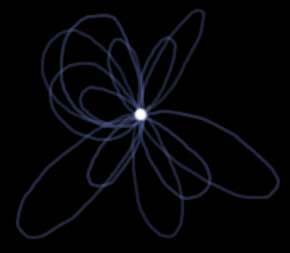 The Earth is absorbing the entire lower half of the spherical system (which can be seen in the next image). If you imagine this image to display not an explosion, but the Sun, then in those circular cloud that lay on the ground, you can see the channels that would hold the orbits of Mercury, Venus, Earth, and Mars. The outer rings are much further away, and also represent the much greater distance to the outer planets, such as Jupiter and Saturn. This Universal Electro-Magnetic structure is the reason energy does not immediately collapse and that matter does not immediately explode. You can see in this explosion image how much Space-Energy is compacted into such small atoms. Likewise, we can know how much energy there is to extend life to a solar system from their enormous stars. For energy to radiate directionally, there is required some sort of physical obstruction or conditional arrangement in the terms of the expression of energy itself. That obstruction can absorb, interact with, or reflect that energy, but even that redirection is based on the radial patterns and intensity of energy. Energy is caused by the unwinding of potential zones. That unwinding can be slow or fast. If we burn a piece of wood the radial energy of heat and light is coming from the severance of molecular bonds that radiate spherically. 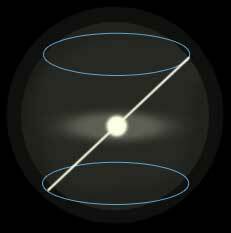 If we split an atom that energy radiates spherically from the point of that explosion. If we heat a wire element enough it will produce light, and radially it will shine. Reality is based on radial expressions of energy that interact to create substantial appearances, NOT substantial appearances made to create energy. For a light to shine, the energy of that light is reduced in potential because the very act of shining reduces the equilibrious pressure difference inside itself. The universe absorbs excess energy naturally, especially if the excessive source is overloaded, thus internally trying to shed energy. All structure is built because of stacking potential zones. Structure and potential zones are built at the material level, the atomic level, and even in the way light shines and interacts with space. Every motion that exists, even on the most subtle level takes part in a whirling tide pool of dynamic energy. From that dynamic space is born patterns, shapes, and principles that can be seen in all creating things. It is important then to start from the very beginning, to see the way light interacts with itself. The universal light has been constricted into a limited expression of itself, comprising a unit of energy in the atom. The shed energy will appear to have a central location, or ‘particle’ if the environment keeps rejecting it’s need to be absorbed. UNDERSTANDING HOW BOUND ENERGY UNITS EJECT ENERGY, making it UNBOUND ENERGY is a good place to begin looking. 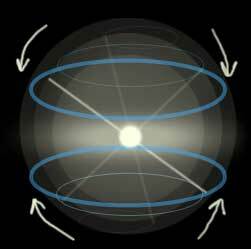 The internal poles of an electromagnetic system are cycling from tall, narrow rotations, to shorter wider rotations. This is caused by the alterations to pressures of the system itself as that system either winds more pressures down, or is pushed into radiation of the energy pressurized. This cycling creates layered (systematically co-existant) pole-pressures. This means that a Bound Energy system is not just a singular polar system, but an inbound and outbound method to record polar activity. The pumping motion creates generational pressures that either register or conflict with the overall system. The system continues to cycle upward again, after its narrowing contraction. This alleviates strain while at the same time pumping the contrasting condition inward. What is exclusionary is reluctantly gained. 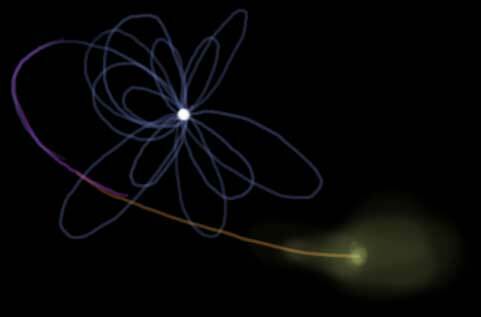 Space begets more action in electric contractions - Electric generation radiates more space-like condition while at the same time excluding energy from the original system. 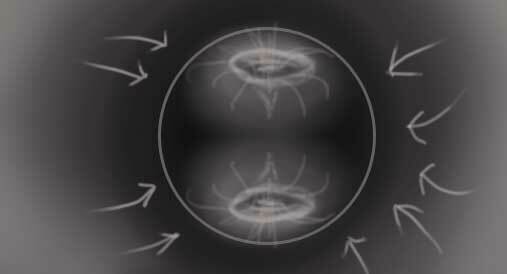 The 'shells' are building around the central system because the environment does not want that energy yet, and also because the magnetism of the system is restraining that energy from total discharge. Again the system pumps downward constricting radiance while building pressure zones. On the atomic level, the system is so inherently strong and balanced that this process will continue onward without system decay for incredible lengths of time. Same with stars which will shed light and heat energy, among other types. Yet this condition will develop pressure systems of different types progressively over countless years. At this point, many pressure zones are built up - and if the conditions are right, or if the internal system is pre-written for it - eventually the system might shed a potential zone creating a new type of material or energy that may shed a type of unbound energy different than, for example, heat and light. Bound energy systems express their own evolution, just as unbound energy evolves upon it's own systematized cycle of expression. When the poles have reached too far, or when the expenditure has caused a leap in radiation, the ejection principles take place and the system ejects a replica of itself in some proportion. When the shedding potential zone is pushed beyond the 'magnetic' grip of the original polar system, the excess charge will take on a course of it’s own. Removed from the immediate system, the replica’s energies collapse and reform into whatever threshold that energy can bare, when it hits the floor of its own momentum internally, and is met with the new resistance in the overall environment. 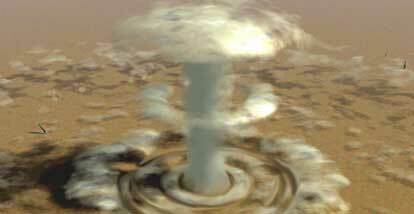 - An atomic explosion in outer space sends light out in 360 degree sphere from that center of explosion. 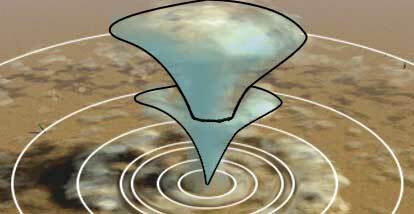 - A loud sound emits a 360 sphere of sound unless there are physical obstructions to block some of that sound. 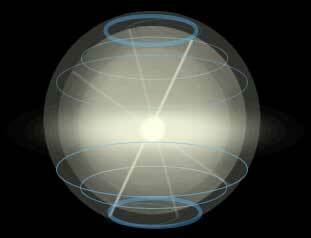 - A Light source emits light radially, unless blocked by some physical object. Energy comes from radial systems, and expresses itself radially, unless there are environmental conditions that force that energy into 'tracks', similar to the way falling water will always settle into the lowest cracks. Potential zones can behave like constrictors or enablers to incoming energy expressions. 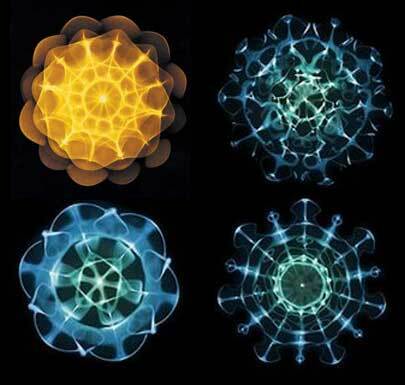 This image displays real sound waves in active expression from a sound source (photo credit misplaced). We can see many geometries that reach outward and collapse inward, evolving in pattern according to the originating sound source, and also according to the environment that expression is passing through. These shapes are radial in nature - but it must be understood that these images represent the 'media of the onlooker' meaning we see what registers on the device that registers it. These shapes are truly more magnificent and both expansive and detailed in reality. 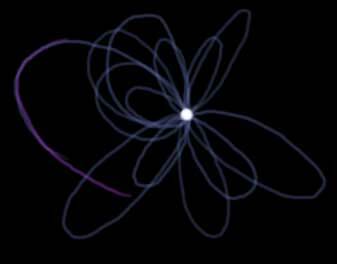 Similarly, an electron described as a small unit is inaccurate, because it is a part of an emission sphere/ring that blooms outward from the originating unit. 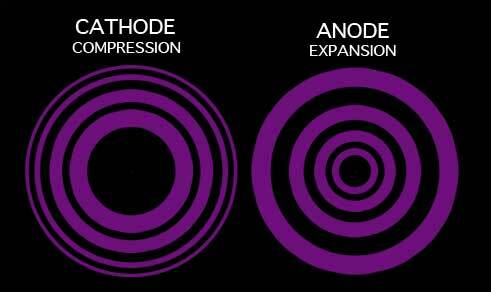 The path of the electron is only the focused production point of emission from that greater sphere of development. The poles always have a leading edge, and the leading edge always has a focal point. Spotting an electron or photon is like registering one of the cross-beams of energy in one of these sound-wave photos - we 'see' what the observational tools can register, and nothing more. This image shows mineral obsidian which fractures in what's called conchoidal pattern. This means that a solid mass of obsidian, when fractured will do so in these spherical patterns; it's pre-written in the obsidian to do this, although in the mass of obsidian there is no sign of these ring-like fractures. 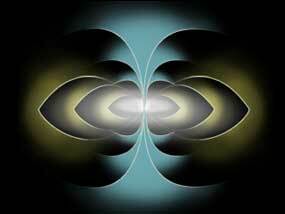 Similarly, the universe composes conchoidal pressure zones that interact and gives appearance to energy units: this is based on motion captured temporarily by the very mathematics that define what portion of space will hold what, when, and for how long. The Universal Light builds with connected proportions. These proportions define principles that yield a method. That method gives definition to energy and also the forms it appears to hold in any given moment. 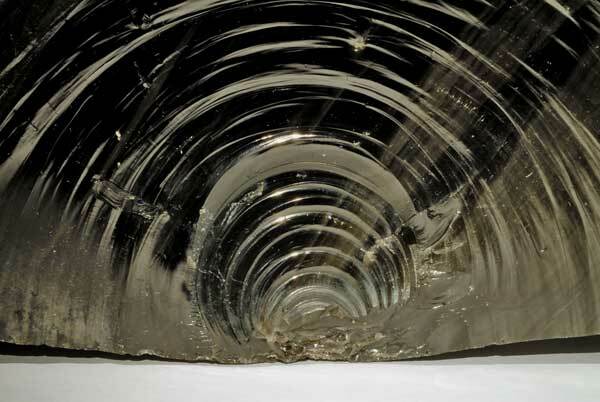 Just as the obsidian willingly fractures in these conchoidal patterns, the universe is already predisposed to setting up bound energy systems, and expressing unbound energy in radial ways. It's pre-established in the universal medium. Because of this, there is required far less energy to perform action of energy than if there was no predisposition. If the obsidian was not predisposed to fracturing in the ring-like patterns, then the only alternative would be to have a stone carver try to chisel out these rings with great effort and concentration. The universe operates on a system of unspeakable efficiency - not by coincidence, but because it could not operate by any other method. Is the radiance of energy 'the effort' - or is the reception of energy by space 'the effort'? Radiance into a receptive system of space is not radiance at all - it is a temporary expulsion of space's conditions that are different from the incoming radiance. Yes, this is awkward to state indirectly so let's say it like this: Space is capable of representing all given forms, so the radiance of light from a tiny candle is accepted easily in space, and without effort, because space only had to shift a small aspect of itself to allow the candle's light to express itself radially. The ability for space to shift itself is inherent in the universe, as space was created at the same fork in the road as energy, and they are permanently intertwined, as they are one and the same thing: a universal method, a display of the universal Lightwave. That universal method has no limits within itself except in the ways it was written to limit itself, temporarily, to express one given thing at a time, as that method describes. 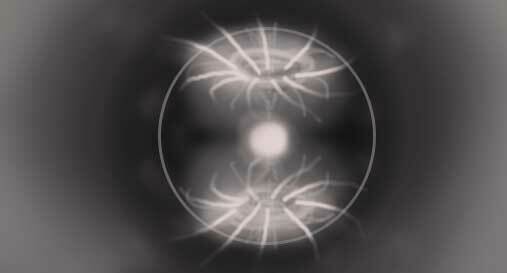 The only reason an electron might seem to take on a life as a singular particle that travels a specific path is because the environment which released that energy is not repellent of the energy, and thus does not convert the electric charge into a Bound Energy System - or because the environment is not absorbent of the electric charge, and thus the electric charge is corralled into a fissure-like travel between subtle resistances within pressure zones of the environment. Here we see enormous amounts of static electricity that exceeded the ability for the clouds to maintain that energy - thus the expulsion has sent the excess energy careening outward. 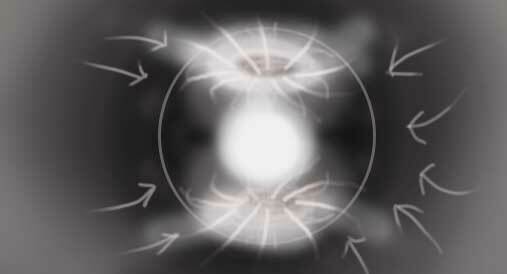 Just as with the candle, the light from this lightening discharge is emanating radially in spheres, but the electric charge is too potent to spontaneously combust and explode outward, and too conforming to abandon it's own path permanently once it has begun. 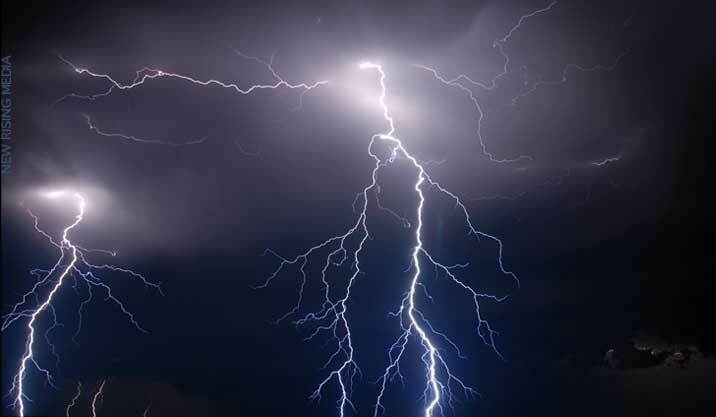 The extended life of this lightning electric current seeks grounding, because the potential is too great and exceeds maximum tolerance of the sky below which cannot hold it. The sea and earth are rammed with the electric charge which seeks the next greatest conduit possible because it has been rejected by all other environments. In that search we can see the many tendrils of lightning branching outward along the annotated pathways. The lighted branches reveal the most accepting pathways of travel through the sky - likely being transmitted through veins of humidity as well as veins of active electric charge that is not yet productive enough to cause lightning itself. The universe absorbs excess, especially if the excessive source is overloaded and moving directionally to a magnetic-radiation tendency. Potential zones are the way all structure is built, and structure is built at the material level, the atomic level, and even in the way light shines and interacts with heat. Every motion at all, even on the most subtle level is a whirling tide pool of dynamic energy. From that dynamic is born patterns, shapes, and principles that can be seen in all creating things. 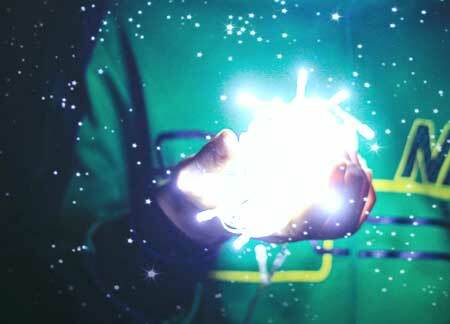 For a physical light source to emit energy is to expend potentials stored up in the light source itself. For the universe, the Lightwave has no energy to use up, because the universe is energy itself, as written in the method that creates the universe itself - and that method includes both sides of the specturum - both charging and discharging - fullness and emptiness - somethingness and nothingness. It is important then to start from the very beginning, to see the way the Lightwave interacts with itself.